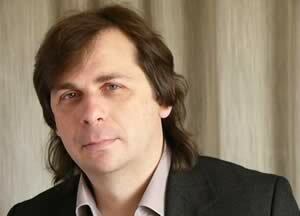 Dono Tsvetkov was born on 14th of June 1959. In 1978 he finished the Secondary school of music in Varna with a specialty “Solo singing”. He studied culture at the University of Varna with Master of art management degree. Almost 12 years he is a professional pop singer and author of songs. He is also a speaker of radio and TV pop music shows as well as the author of various articles about pop and rock music. After the political change in Bulgaria in 1989 he creates a Musical Production Studio called "YES"- the first Bulgarian private vocal pop school and realizes a lot of projects, such as rock bridges, rock stages, musical performances, concerts, songs production etc. In 1992 he starts his two significant projects. The first one, called Rock Hit, is the first Bulgarian private competition for rock songs. The second is the International Pop Festival "Discovery". Today the festival includes a national and an international competition for pop singers (the only one now in Bulgaria) with rich accompanying art programs, such as exhibitions, theatre performances, international theoretical meetings, discussions etc. Dono Tsvetkov manages many Bulgarian singers who participate in different International music festivals and competitions. Member of F.I.D.O.F. (1994-2001)He has been member of the international jury of different festivals such as: "A Step to Parnas" (Moscow, Russia, 1994), "Pamukkale" (Turkey, 1996, 1997), "Voice of Asia" (Kazakhstan, 1998,1999), "Vilnius" (Lithuania, 1996, 1997, 1999, 2000), Malta Song Festival & TV Malta Song Festival (1999), "Calatis (Romania, 2000), "Konin'2000" (Poland), "Universtalent" (Prague, Czech .Republic, 2000, 2001,2004) , « Tenerife 2004» ( Espana ), "Zrenjanin" ( Serbia , 2005) , "Komrat2005" (Moldova), " Canzoni dal mondo"( Italy , 2005) еtc .